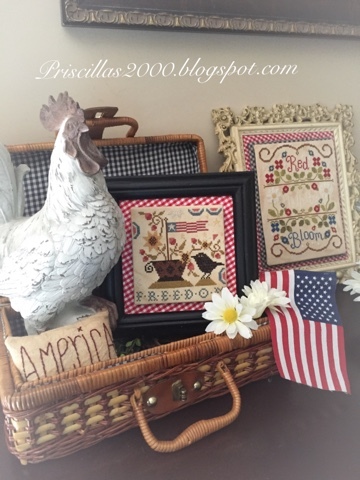 Priscillas: A Red ,White and Blue Stitchmaynia finish! 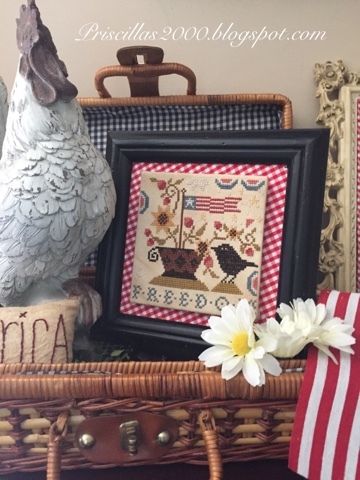 You really have wonderful ideas for displaying needlework! I really like your Stitchmaynia piece. Love the colors, the Flag, the bird, and everything else. Great finish! Great patriotic display. Your stitchery is lovely. I get your emails. It's nice getting mail. Are you getting mine? Hi Priscilla, do you have to belong to the group to get this freebie? If so, can anyone join? What a gorgeous display. I just joined the group and I'm waiting for acceptance. I loved that piece when you were working on it and wanted to buy it....and now it's a freebie? It's my lucky day! Thank you for all you share with us. I just joined the Star Spangled Stitchers and I can't find this chart. Where do I find it? I love this.